Peroxisome proliferator-activated receptor (PPAR)γ may be a key regulator of connective tissue deposition and remodeling in vivo. PPARγ expression is reduced in dermal fibroblasts isolated from fibrotic areas of scleroderma patients; PPARγ agonists suppress the persistent fibrotic phenotype of this cell type. Previously, we showed that loss of PPARγ expression in fibroblasts resulted in enhanced bleomycin-induced skin fibrosis. However, whether loss of PPARγ expression in skin fibroblasts affects cutaneous tissue repair or homeostasis is unknown. Mice deleted for PPARγ in skin fibroblasts show an enhanced rate of dermal wound closure, concomitant with elevated phosphorylation of Smad3, Akt and ERK, and increased expression of proliferating cell nuclear antigen (PCNA), collagen, α-smooth muscle actin (α-SMA) and CCN2. Conversely, dermal homeostasis was not appreciably affected by loss of PPARγ expression. PPARγ expression by fibroblasts suppresses cutaneous tissue repair. In the future, direct PPARγ antagonists and agonists might be of clinical benefit in controlling chronic wounds or scarring, respectively. If the dermis is injured, specialized fibroblasts called myofibroblasts repopulate the wound and synthesize and remodel new connective tissue . Wound repair is very complex and dynamic, involving the interactions of multiple cell types and growth factors/cytokines; dysregulation of this process results in chronic wounds or fibrosis . Thus, understanding the molecular mechanisms controlling the normal tissue repair program is likely to be of clinical relevance. Expression of the nuclear receptor peroxisome proliferator-activated receptor (PPAR)-γ is reduced in dermal fibroblasts isolated from fibrotic lesions of patients with the autoimmune connective tissue disease scleroderma (systemic sclerosis, SSc); moreover, the PPARγ agonist rosiglitazone reverses the persistent fibrotic phenotype of this cell type . Normally, PPAR-γ is bound to the retinoid X receptor (RXR) and co-repressors, preventing its binding to DNA; however, upon receptor ligation, the co-repressors are displaced from the PPAR-γ/RXR complex allowing PPAR-γ to bind PPAR-γ response elements in the promoters of target genes . The PPAR/RXR transcriptional complex plays a critical role in maintaining energy balance, which is dysregulated in conditions such as obesity, diabetes, and atherosclerosis . An increasing body of evidence also suggests that PPAR-γ plays a key role in connective tissue turnover, a key process involved with tissue remodeling . Both in vivo and in vitro, PPAR-γ agonists inhibit basal and transforming growth factor (TGF)-β-induced collagen deposition and myofibroblast differentiation [6, 7]. Although loss of PPARγ expression in cultured mouse embryonic fibroblasts results in enhanced, constitutive Smad3 phosphorylation and collagen production , loss of PPARγ expression in cultured adult mouse fibroblasts appears to be insufficient to result in either Smad 3 activation or collagen production . Instead, adult dermal fibroblasts lacking PPARγ expression show enhanced sensitivity to exogenously added TGFβ in terms of enhanced phosphorylation of Smad3 and expression of collagen/α-SMA mRNA . Collectively, these data strongly suggest that PPARγ may play a role in fibrosis by enhancing cellular responses to TGFβ. Recently, we showed that mice harboring a fibroblast-specific deletion for PPARγ displayed an enhanced susceptibility to bleomycin-induced skin scleroderma . These observations suggest that PPARγ might be an important regulator of cutaneous tissue repair and homeostasis in vivo; however, this hypothesis has yet to be tested. Herein, we subject mice harboring a fibroblast-specific deletion of PPARγ to the dermal punch model of cutaneous tissue repair. Moreover, we assess whether loss of PPARγ expression by skin fibroblasts affects dermal homeostasis. Our results reveal new insights into the role PPARγ plays in fibroblast biology. The deletion of PPARγ in skin fibroblasts. (A) Mice homozygous for loxP-PPARγ and hemizygous for an allele enabling a tamoxifen-dependent cre recombinase to be expressed under the control of a fibroblast-specific collagen type I promoter/enhancer were injected with tamoxifen or corn oil to generate mice deleted (K/K) or not (C/C) for PPARγ in fibroblasts. PCR genotyping of PPARγ WT (C/C) or PPARγ KO (K/K) mice. The upper panel shows the PCR result using primers detecting cre (approximately 650 bp band); the bottom panel shows the PCR result with specific primers which amplify Exon I and Exon II-deleted PPARγ after tamoxifen injection (approximately 350 bp band). (B) Western blot analysis of WT (C/C) and PPARγ KO (K/K) fibroblasts with an anti-PPARγ antibody. (C) Indirect immunofluorescence analysis of WT (C/C) and PPARγ KO (K/K) mice skin samples (original magnification × 40, bar = 25 μm) using an anti- PPARγ antibody. Red = PPAR gamma; Blue = DAPI. DAPI, 4',6-diamidino-2-phenylindole; PPARγ, peroxisome proliferator-activated receptor-γ. Wound closure is faster in PPARγ KO (K/K) mice than WT (C/C) mice. (A) Photography of wound sites at different time points after wounding (N ≥ 12 for each time point, four wounds for each mouse) (B) Quantification of wound size at different time points after wounding. Asterisks indicate significant differences between WT and KO groups (** = P < 0.01; *** = P < 0.001). D, day. PPARγ, peroxisome proliferator-activated receptor-γ. Histological analysis of PPARγ KO (K/K) mice and WT (C/C) wound tissue. (A) H&E and (B) trichrome staining of day 7 wounds (C/C: N = 10; K/K: N = 12, original magnification × 5, bar = 200 μm). The arrow indicates wound width. (C) The collagen content in each section was assessed by three blinded observers using the following assessment criteria: 0 signifies no collagen fibers, 1 signifies a few collagen fibers, 2 signifies a moderate amount of collagen fibers, and 3 signifies an excessive amount of collagen fibers. (D) Immunofluorescence analysis using an anti-type I collagen antibody. (WT: N = 10; KO: N = 12, original magnification × 20, bar = 50 μm). Red-PPARγ; Blue-DAPI. (E) Quantification of type collagen I protein expression in wound tissues at Day 7 after wounding. *** = significant difference between C/C-WT and K/K-KO groups (P < 0.001). DAPI, 4',6-diamidino-2-phenylindole; PPARγ, peroxisome proliferator-activated receptor-γ Loss of PPARγ results in enhanced collagen, α-SMA, PCNA and CCN2 expression. As loss of PPARγ resulted in an enhanced rate of tissue repair, we assessed whether loss of PPARγ also promoted collagen deposition. 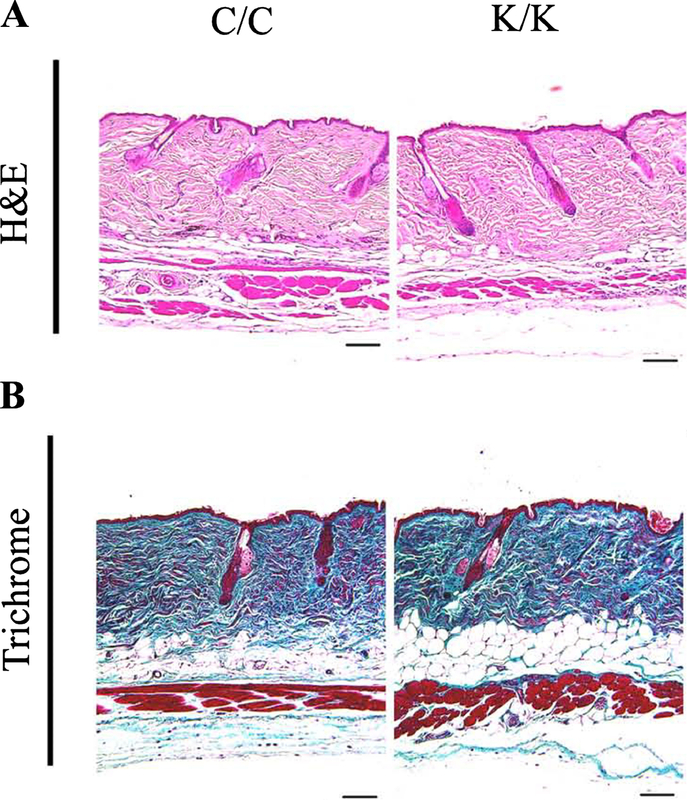 Blind histological analysis of trichrome-stained sections showed a greater collagen score in wounded PPARγ (K/K) compared to control (C/C) mice (Figure 3B, C). Assessment of collagen content using an anti-type I collagen antibody (Figure 3D, E) further confirmed that animals deficient in PPARγ possessed elevated collagen levels at day 7 post wounding. We then assessed the effect of loss of PPARγ on myofibroblast induction. Immunohistochemical analysis showed greater expression of a-SMA in day 7 and day 10 wounds of PPARγ knockout (K/K) mice compared to control (C/C) mice (Figure 4A, B). Western blot analysis on protein samples prepared from control and bleomycin-treated animals further confirmed elevated a-SMA production in day 7 wounds of PPAR-deficient (C/C) mice compared to control (K/K) mice (Figure 4C). Fewer neutrophils were found in the wounds of PPAR-deficient (C/C) mice compared to control (K/K) mice (Figure 4D), consistent with the increased rate of wound resolution observed in these mice. 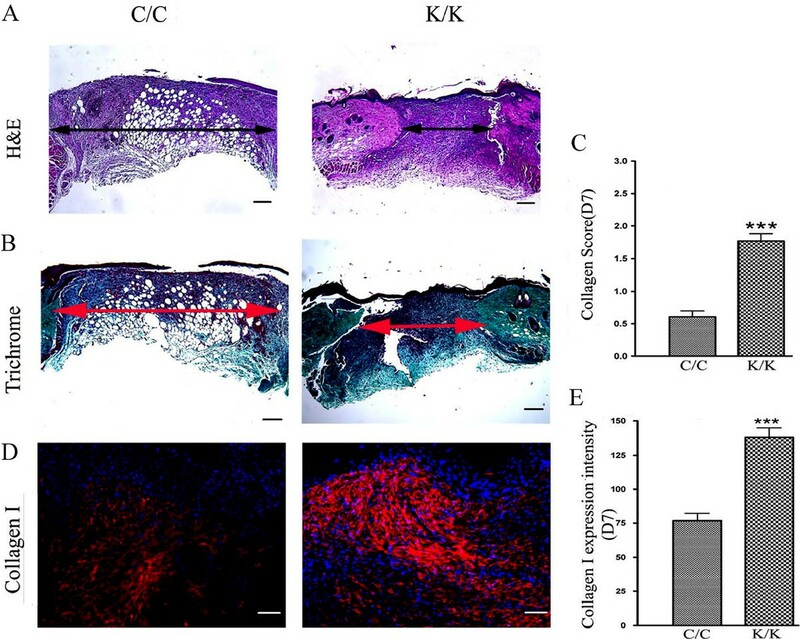 Furthermore, PCNA (a marker of cell proliferation) and CCN2 (a marker of tissue repair and fibrosis) expression were also significantly induced in the skin of day 7 and day 10 PPAR -deficient (C/C) mice compared to control (K/K) mice (Figure 5A, B). Similarly, elevated CCN2 mRNA expression was observed in PPAR-deficient fibroblasts (Figure 5C). Intriguingly, troglitazone, a PPARγ agonist, decreased CCN2 mRNA expression in both wild-type and PPARγ-deficient fibroblasts (Figure 5C) suggesting that troglitazone operates through PPAR-independent mechanisms (Figure 5C). Alpha-SMA expression is enhanced in PPARγ KO (K/K) wound tissue (day 7 and day 10 post-wounding). 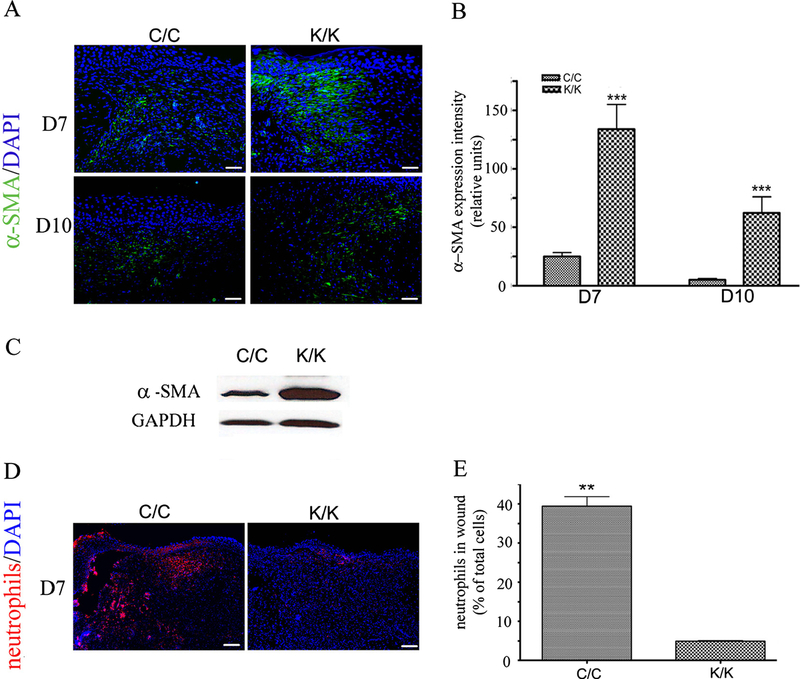 (A) Indirect immunofluorescence analysis of WT (C/C) and PPARγ KO (K/K) mice with an anti-α-SMA antibody (C/C: N = 10; K/K: N = 12, original magnification × 20, bar = 50 μm). Green, α-SMA; Blue, DAPI. (B) Quantification of α-SMA expression intensity in wound tissues at day 7 and day 10 after wounding. (C) Western blot of α -SMA expression in WT (C/C) and PPARγ KO (K/K) wound tissues at day 7 after wounding. GAPDH = loading control. (D) Indirect immunofluorescence analysis of WT (C/C) and PPARγ KO (K/K) mice with an anti-neutrophil antibody (C/C: N = 10; K/K: N = 12, original magnification × 20, bar = 100 μm). Red, neutrophils; Blue, DAPI. (E) Quantification of neutrophils in wound tissues at day 7 after wounding. Asterisks indicate a significant difference between C/C and K/K groups (** = P < 0.01; *** = P < 0.001). DAPI, 4',6-diamidino-2-phenylindole; PPARγ, peroxisome proliferator-activated receptor-γ. PCNA and CCN2 expression is enhanced in PPARγ KO (K/K) fibroblasts. 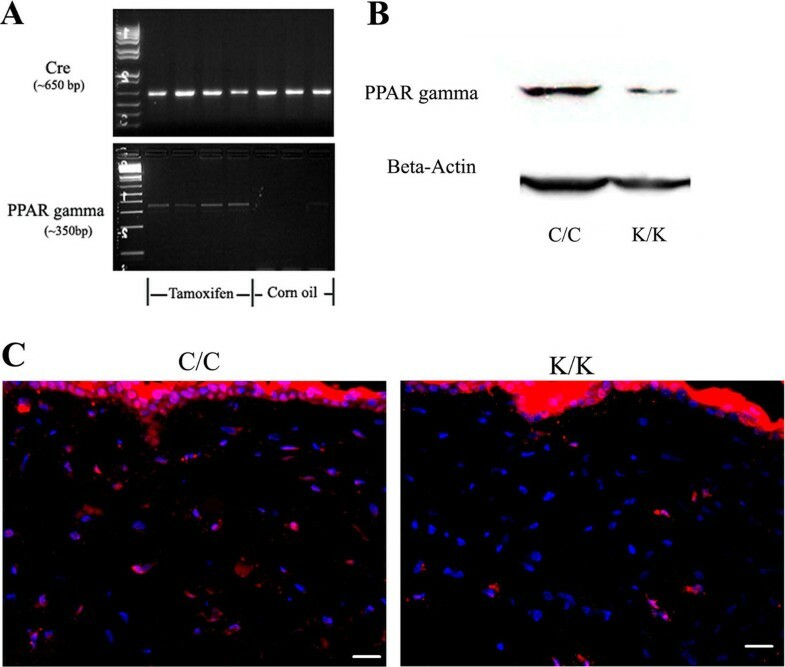 Indirect immunofluorescence analysis of WT (C/C) and PPARγ KO (K/K) mice (day 7 and 10 post-wounding) with (A) an anti-PCNA antibody and (B) an anti-CCN2 antibody (C/C: N = 10; K/K: N = 12, original magnification × 20, bar = 50 μm). Red, CCN2;Blue, DAPI. *** = indicates significant difference between C/C and K/K groups (P < 0.001). (C) Real time PCR analysis of WT (C/C) and PPARγ KO (K/K) fibroblasts treated with or without troglitazone (40 μM, 24 hours). Primers detecting CCN2 and 18S mRNAs were used. Expression relative to CCN2 expression in untreated WT (C/C) fibroblasts is shown. Average +/- standard deviation (N = 3) is shown. ** = significant difference between groups (P < 0.01). Note that CCN2 mRNA expression was elevated in (K/K) fibroblasts; troglitazone (+trog) reduced CCN2 mRNA expression in both (C/C) and (K/K) fibroblasts indicating that troglitazone operated independent of PPARγ. DAPI, 4',6-diamidino-2-phenylindole; PCNA, proliferating cell nuclear antigen. ; PPARγ, peroxisome proliferator-activated receptor-γ Loss of PPARγ results in enhanced Smad3, Akt and ERK phosphorylation. In skin fibroblasts, loss of PPARγ has been shown to result in enhanced phosphorylation of Smad3 in response to bleomycin or TGFβ . Consistent with these data, we showed, using indirect immunofluorescence with an anti-phospho-Smad3, that Smad3 phosphorylation was enhanced seven days post-wounding in PPARγ-deficient animals (Figure 6, p-Smad3). Moreover, enhanced phosphorylation of Akt, a protein that is phosphorylated downstream of TGFβ and has previously been shown to be activated in fibrosis and to be modified by PPARγ [10–14], was also observed in the skin of day 7 and day 10 wounds of PPARγ-deficient animals (Figure 6, p-Akt). Finally, enhanced phosphorylation of ERK, a protein that is also phosphorylated downstream of TGFβ and shown to be modified by PPARγ [14–17], was also observed in the skin of day 7 and day 10 wounds of PPARγ-deficient animals (Figure 6, p-ERK). Collectively, these data indicate that loss of PPARγ expression in skin results in elevated pro-fibrotic signaling. Elevated p-Akt, p-Smad3 and p-Erk staining in PPARγ KO (K/K) wound tissue (day 7 and day 10 post-wounding). Indirect immunofluorescence analysis with anti-, anti-p-Smad3 and anti-p-Erk antibodies, as indicated, in wound tissues day7 and day 10 post-wounding (C/C: N = 10; K/K: N = 12, original magnification × 20, bar = 50 μm). p-Akt, p-Smad3 and p-Erk expression intensity, respectively, are shown. Asterisks indicate a significant difference between C/C and K/K groups (** = P < 0.01; *** = P < 0.001). PPAR, peroxisome proliferator-activated receptor-γ. A priori, we would have expected that, as loss of PPARγ resulted in increased Smad3 and Akt phosphorylation in response to bleomycin or punch wounding , this report, loss of PPARγ expression by itself might have been sufficient to result in skin fibrosis. However, PPARγ-deficient skin did not show significant alterations in skin thickness or matrix accumulation even four months after the PPARγ gene was deleted (Figure 7A, B). Loss of PPARγ expression in dermal fibroblasts does not appreciably affect skin homeostasis. WT (C/C) and PPARγ KO (K/K) skin samples at four months (C/C: N = 5; K/K: N = 6) after tamoxifen injection were examined (original magnification × 10, bar = 100 μm). (A) H & E and (B) trichrome staining. PPAR, peroxisome proliferator-activated receptor-γ. Collectively, our results indicate that, in vivo, PPARγ normally acts in dermal fibroblasts to suppress fibrogenic responses. In this study, we tested the effect of loss of PPARγ in dermal fibroblasts on cutaneous tissue repair in vivo. 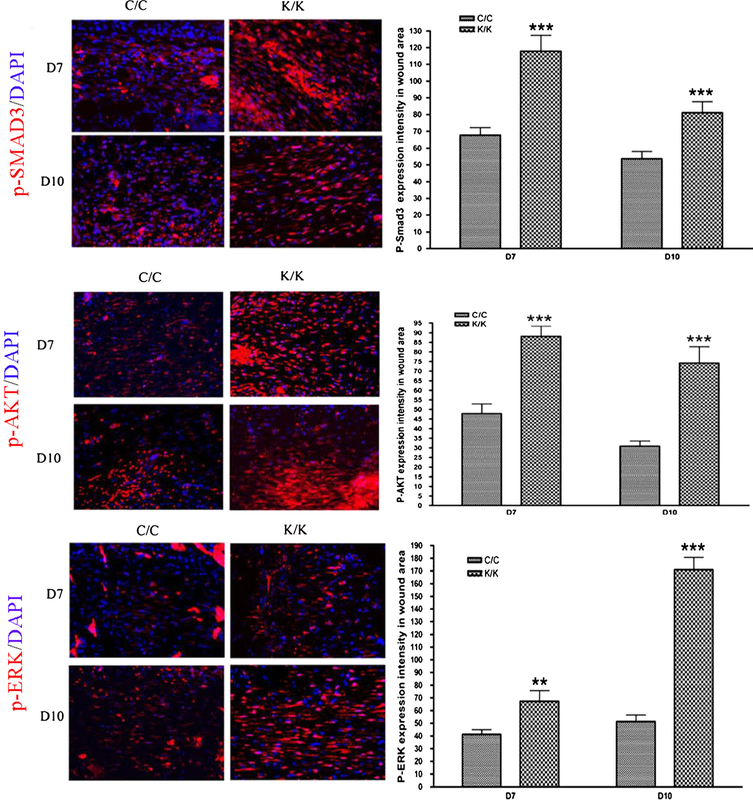 PPARγ-deficient mice showed enhanced responsiveness to tissue injury, as shown by increased wound closure on days three, five, seven and ten post-wounding, increased collagen production, the appearance of α-SMA-expressing myofibroblasts, elevated CCN2 expression and enhanced Smad3/Akt phosphorylation. These results are consistent with previous observations that PPARγ-deficient fibroblasts showed enhanced sensitivity to TGFβ1 and that PPARγ-deficient mice showed increased susceptibility to bleomycin-induced skin fibrosis [8, 9]. These data also agree with prior studies showing that, in fibroblasts, PPARγ agonists block TGFβ-induced α-SMA and collagen expression . Moreover, we showed that, although CCN2 mRNA was elevated in PPARγ-knockout fibroblasts, troglitazone suppressed CCN2 mRNA in both wild-type and PPARγ-knockout fibroblasts. Although it is possible that these PPARγ agonists were active due to the small residual expression of PPARγ in PPARγ knockout fibroblasts, these data do not exclude the notion that thiazolidinediones such as troglitazone have potent 'off-target' effects independent of PPARγ itself . Nonetheless, these data collectively suggest that PPARγ normally suppresses fibrogenic responses in vivo and also support the notion that developing novel classes of direct PPARγ agonists/antagonists is warranted. We found that long-term (up to four months) deletion of PPARγ did not appreciably affect dermal homeostasis. This result is consistent with our previous data showing that mice deficient in PPARγ expression in fibroblasts (approximately six weeks post-deletion of PPARγ), although possessing enhanced susceptibility to bleomycin-induced skin fibrosis, possessed no detectable alterations in skin structure . PPARγ is known to upregulate the tumor suppressor PTEN; loss of PTEN expression by dermal fibroblasts results in skin fibrosis due to an increase in Akt phosphorylation [13, 18]. Intriguingly, we found that PTEN expression was increased and not decreased in the dermis of PPARγ knockout mice (data not shown). These observations suggest that PPARγ knockout mice may upregulate PTEN expression to compensate for the loss of PPARγ expression by dermal fibroblasts and provide a plausible explanation why dermal homeostasis was not appreciably altered in PPARγ knockout mice and injury, whether caused by bleomycin or by dermal punch wounding, is required to elicit a phenotype in PPARγ knockout animals. In summary, our studies examining the involvement in PPARγ in skin indicate that PPARγ normally acts in fibroblasts to retard tissue repair. These results suggest that direct PPARγ agonists and antagonists might be used to control the tissue repair program, for example, by suppressing scarring or by promoting the closure of chronic wounds. Mice, hemizygous for an allele expressing tamoxifen-inducible Cre-recombinase (under the control of a fibroblast-specific regulatory sequence from the proa2(I) collagen gene ) and homozygous for a loxP-PPARγ allele, were generated as described previously . Mice deleted (K/K) or not (C/C) for PPARγ in fibroblasts were generated by treating three-week-old mice each day for five days with tamoxifen (4-hydroxitamoxifen, Sigma, St. Louis, MO, USA) in corn oil (0.1 ml of 10 mg/ml) or corn oil. Deletion of PPARγ was verified by PCR genotyping (Jackson Laboratories, Bar Harbor, ME, USA).γ All animal protocols were approved by the regulatory authority of the appropriate experimental animal committee. Dermal fibroblasts, isolated from explants (four- to six-week-old animals) as described, were subjected to indirect immunofluorescence analysis followed by an appropriate secondary antibody (Jackson Immunoresearch, West Grove, PA, USA) as described . Photography (Zeiss Axiphot) was performed using a digital camera (Empix, Mississauga, ON, Canada). For some assays, cells were lysed in 2% SDS, proteins quantified (Fisher, Nepean, ON, Canada) and subjected to Western blot analysis . Antibodies used were: anti-a-SMA (Sigma,1:3000), anti-β-actin (1:5000, Sigma) and anti- PPARγ (Santa Cruz, Santa Cruz, CA, USA,1:500).γ Human dermal fibroblasts were purchased (American Type Culture Collection, Manassas, VA, USA). Cells were grown in (D)MEM, 10% fetal bovine serum (Life Technologies, Burlington, ON, Canada). To assess the effects of PPARγ deletion on collagen synthesis, trichrome collagen stain was used. Collagen content in each section was assessed by three blinded observers using the following assessment criteria: 0 signifies: no collagen fibers; 1 signifies: few collagen fibers; 2 signifies: moderate amount of collagen fibers; 3 signifies: excessive amount of collagen fibers. Non-specific immunoglobulin G (IgG) binding was blocked by incubating sections with BSA (0.1%) in PBS for 1 hour and then incubated with primary antibody in a humidified chamber and left overnight at 4°C. Next, sections were washed and incubated with a secondary antibody for 1 hour. Primary antibodies used were: PPARγ (Santa Cruz, Rabbit, sc-7196, 1:500) PTEN (Cell Signaling, Pickering, ON, Canada, #9559, Rabbit, 1:500) CCN2 (Abcam, Cambridge, MA, USA, ab6992, Rabbit, 1:250), α-SMA (Sigma, A5228, mouse, 1:2000); ColIa2 (Santa Cruz, sc-28654, rabbit, 1:500), PCNA: (Abcam, ab2426-1, rabbit, 1:500); p-SMAD3: (Abcam, rabbit, ab52903, 1:200); p-AKT (Rockland Immunochemicals, Gilbertsville, PA, USA, 200-301-268, mouse), (1:500); p-ERK (Cell Signaling, #9101, rabbit, 1:500) and neutrophil marker (Santa Cruz, sc-59338, rat,1:100). Secondary antibodies (Jackson Immunoresearch, 1:400) were: Dylight 488 conjugated donkey anti-mouse (711-485-150); Dylight 594 conjugated donkey anti-rabbit (711-485-152); Dylight 594 conjugated donkey anti-mouse (715-515-150) and Dylight 594 conjugated donkey anti-rat (712-516-150). Real-time PCR to detect the expression of target genes was performed essentially as previously described [20, 21]. Cells were cultured until 50% confluence and treated for 24 hours with dimethyl sulfoxide (DMSO) or troglitazone (40 μM, EMD Biosciences, Billerica, MA, USA) and total RNA was isolated (RNeasy; QIAGEN, Toronto, ON, Canada). Total RNA (25 ng) was reverse transcribed, amplified using Taq-Man Assays-on-Demand in the presence One-Step MasterMix and detected using the ABI Prism 7900 HT sequence detector (Life Technologies). Triplicate samples were run, and expression values for CCN2 were standardized to values obtained with control 18S primers using the ΔΔCt method. Statistical analysis was done using one way analysis of variance (ANOVA) and Tukey's post-hoc test on Graphpad Prism 4 software. This work is supported by grants from the Canadian Institutes of Health Research (to AL and MB) and the Ontario Scleroderma Society (to AL). AL is a member of the Canadian Scleroderma Research Group New Emerging Team. WS and KT were the recipients of salary awards from the Canadian Scleroderma Research Group. WS conducted the in vivo studies and tissue analysis. KT and JS carried out the cell culture and real time PCR analysis. MB participated in design of the study. AL conceived of the study, and participated in its design and coordination. WS, KT, MB and AL wrote the paper. All authors read and approved the final manuscript.